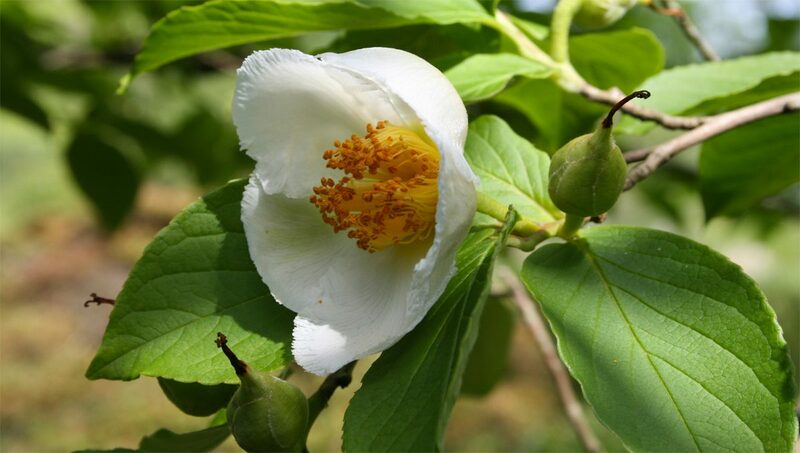 Ok, so we are not talking about the American film stage actor here, but it is a good way to remember the name of one the most interesting and distinctive trees available today, Japanese Stewartia, Stewartia pseudocamellia. This small (20-30’), deciduous multi-stemmed ornamental tree has interest all year long; glorious fall color; showy tea-like flowers around mid June; vivid and eye catching exfoliating bark. Named ‘pseudocamellia’ which roughly means it disguises itself as a camellia when in bloom (a reference to white June-into-July flowers, and the fact they are very distant relatives in the Tea Family). 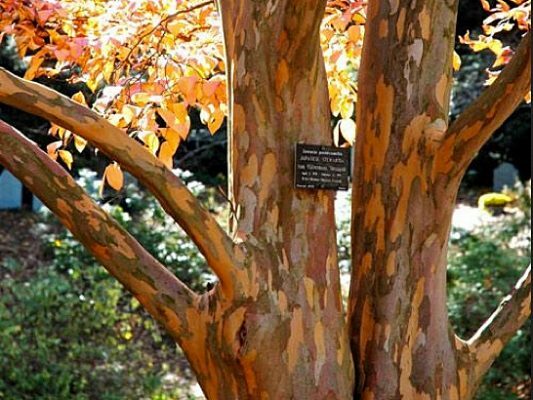 Grown in part shade to sun, this specimen tree has so much more to offer then its delicate white flowers. All Stewartias have distinctive exfoliating cinnamon-colored bark that can look quite impressive against a white carpet of snow. In the winter, the tree displays strips of gray, orange, and reddish brown once the trunk attains a diameter of 2-3 inches.